Back at Pugging Pally I used to do art posts fairly often. I think it’s a fine tradition that I wouldn’t mind continuing! Here is a commission I just recently finished for a friend of Lara‘s. 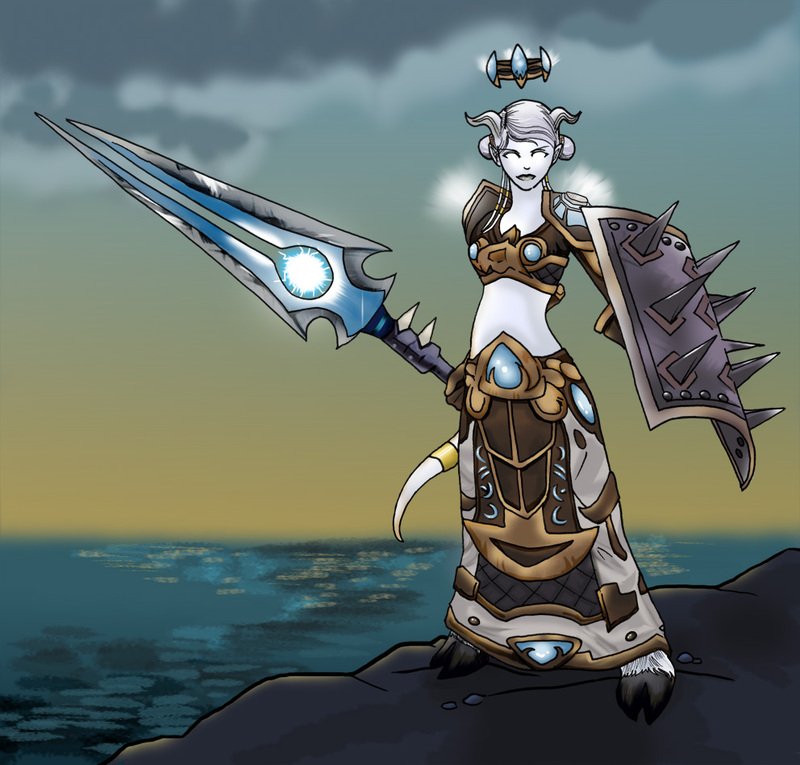 This is her draenei paladin, Tal, and she is awesome (if I do say so myself). The armour was conceived of by her and assembled/altered by the two of us with our brainstorming; it’s a combination of the Tier 8 paladin set combined with Tier 6 (shoulders and crown). I changed the colours of those pieces so that they would look as if they were part of the T8 set. Because you all know how I feel about draenei. Draenei. Are. Awesome! I made a warrior. And all she’s been doing is tanking (ulp). Meantime, Voss provides useful information about tanking. I think it’s a fun combination, especially for anyone else who may be interested in leveling lowbie warrior tanks. That’s something that Vid was always lacking as she leveled – I couldn’t tell people about good choice to make because I really was just figuring it out as I went along. Unlike me, Voss knows what he is doing. It may take my little warrior a long time to level this way, but the journey promises to be a nerve-wracking one. Mosey over and read Looking To Be A Great Warrior? if you are so inclined! Very nice. Love the choice of armor. That is my favorite shield. I’m not sure if I’ve said this before, but I love your drawing style! Fantastic job on the background as well, it really enhances the image. Gorgeous art! I remain impressed, as always. Really, Payce? I’m SHOCKED. Absolutely shocked. (I paused this comment to read because you MUST have blogged about it). Welcome to the Light side (again). Thanks for your kind words about the image. It’s hard to make a draenei look BAD, really. But I may be biased. Gorgeous! I love how the background supports and complements the colors of the armor without overwhelming it.